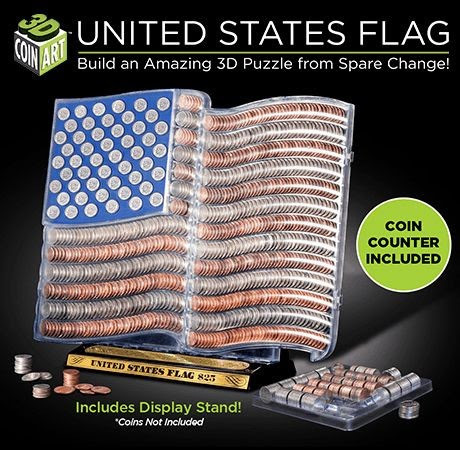 3D Coin Art Puzzle & Bank Just $24.95 PLUS FREE Shipping! Perfect Gift! 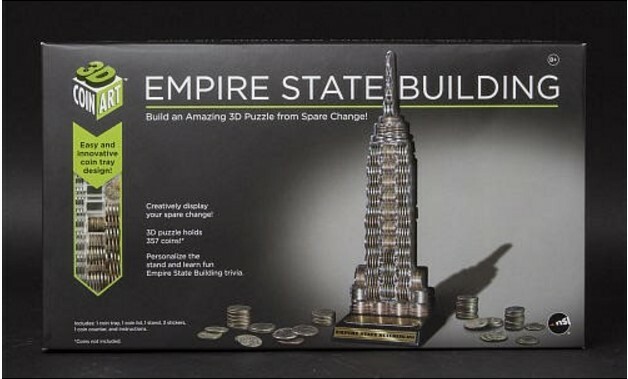 You are here: Home / Sponsored / 3D Coin Art Puzzle & Bank Just $24.95 PLUS FREE Shipping! Perfect Gift! NSI sent me one of these awesome 3D Coin puzzle/banks to check out and tell you about. It’s such a cool thing, I think. I can see it being an awesome gift for kids and adults alike. My Mom enjoys saving coins and counting them with the great grands, so she would love this. I had a son who collected everything when he was growing up and would have loved this! My Mother In Law loves Patriotic decor in her home, so this would be great for her! I think this would just make a great gift for so many different people, I can’t even decide who would like it the most! I do have to say I wasn’t expecting it to be the size it is. It’s not too large but definitely a room decor item that would not be missed, for sure! It’s a great conversation starter, too. It’s a puzzle! It’s a bank! It’s a model that you build with spare change! Introducing 3D Coin Art™ by New York City-based NSI International Inc. – an innovative way to create amazing 3D works of art out of coins. If you’re thinking about gifts for any occasion you might want to take a look at this – it is so well made and sturdy. I love that it’s not a one and done type deal, it’s something that would take time to save and add to and figure out! They even have one of the Empire State Building, too! I couldn’t decide between the 2 I think both would be great gifts for almost anyone!